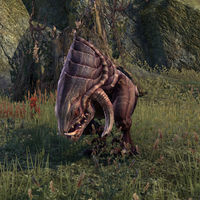 Kagouti are aggressive creatures that are, like their close relatives the alit, native to Morrowind. They are also found in Shadowfen. It is rare to find more than one in the same place; the Triple Circle Mine near Mournhold is a unique case, and a good place to hunt packs of kagouti. Kagouti are also available as mounts. A charged melee attack that does moderate physical damage. This attack can be blocked to set the kagouti off balance. The kagouti charges forward, doing moderate physical damage and knocking down all enemies as indicated by a red rectangle. If the kagouti does not hit anything, it will be stunned briefly. From Patch 1.5.2, Kagouti now charge. This page was last modified on 17 January 2019, at 15:07.